PHILIPSBURG - On Tuesday 10-10-17, Prime Minister William Marlin and Minister of Tourism, Economic Affairs, Traffic and Telecommunication Melissa Arrindell Doncher welcomed the 1st commercial flights to Sint Maarten marking the re-opening of PJIAE / SXM Airport. The two Ministers were present 7:50 am in the morning to welcome the first flight, WINAIR that arrived from Saba beginning the historic day that saw 6 flights land with one cancellation. Around midday a festive welcome ceremony was organized that included live music, ladies in beautiful carnival costumes, give away items, finger food snacks & cold beverages. The special welcome was put together by SXM Airport, SXM Tourism Bureau and Toppers Restaurant for the arrival of Delta Airlines, American Airlines and the remaining flights for the day. PAWA Airlines completed the final flight of the day, arriving from Santo Domingo with residents and visitors to the island. 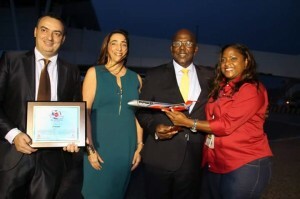 The Commercial Director of PAWA Sebastian Garcia upon his arrival presented Prime Minister William Marlin with a replica model of a PAWA airplane. Written on it were the words, “Together we fly higher even under the strongest storms”. Prime Minister Marlin in turn presented Mr. Garcia with a plaque indicating Sint Maarten is open. “We are very grateful and thankful for the support and your arrival is a sign of confidence in the recovery of Sint Maarten,” he said. The Prime Minister also recognized PAWA as the airline that flew in the most relief goods during the period when only humanitarian flights were allowed following the passing of Hurricane Irma.